Slow motion of woman listen to music and dance around. She sink herself into the pop songs. 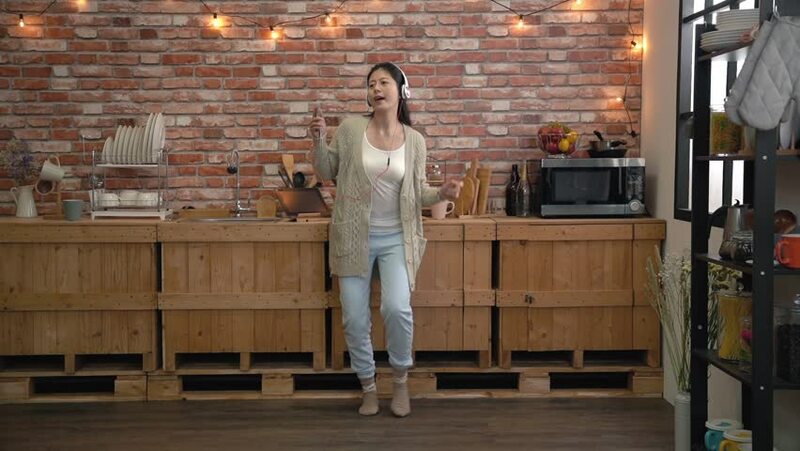 hd00:21Slow motion of a woman holding a personal concert in home kitchen, one hand holding scoop as a microphone, another waving to camera. hd00:28Slow motion of woman swinging gracefully in the home kitchen accompanied by classical music in her headphone. hd00:16Slow motion of housewife interacting with her imagination audiences. 4k00:15A young cheerful brunette woman, in a white warm sweater and cowboy hat, descends the stairs from the porch of a fabulous wooden house made of round logs. Rest on an autumn evening. Slow motion. 4k00:14Happy Young Woman Is Having Fun. Kitchen Interior In The Background. 4k00:26Beautiful young mother and her little daughter at the pediatrician. Doctor is examining little patient using a stethoscope to check lung and heart and kid deep breath. hd00:20Young student at home desk reading and yawning tired at night with pile of books and coffee cup preparing exhausted an exam in university education concept. 4k00:25young female touching her perfect hairless smooth soft and silky shoulder arm skin. hd00:26student learning online with headphones and computer laptop. mixed race asian chinese model.